Brookfield Infrastructure often gets lumped in with high-yield utilities like Duke Energy -- it's a better dividend growth stock than that. Duke Energy Corporation (NYSE:DUK) is a diversified utility; there's little to no debate about this. Brookfield Infrastructure Partners (NYSE:BIP) is often compared to utilities, but that's a vast simplification of both what it owns and its long-term purpose. There's nothing wrong with Duke Energy, but here's why investors looking at a slow-growth utility like Duke might want to take a closer look at Brookfield Infrastructure instead. Duke Energy offers investors a solid 4% yield. The dividend has been increased every year for 14 consecutive years. The historical dividend growth rate has averaged about 3% over the trailing three- five-, and 10-year periods. Although dividend growth is expected to pick up a little (into the 4% to 6% range), investors should probably expect something roughly in line with, or just a little above, inflation-rate dividend growth over time. The company has a diversified utility portfolio, with regulated electric and natural gas utilities accounting for the bulk of its business. However, it also has a renewable merchant power operation and exposure to midstream pipeline assets. Since much of its business is regulated, Duke has to get rate hikes approved by the government. That means laying out capital spending plans years in advance. Right now, Duke has around $32 billion worth of spending on the books between 2018 and 2022. That spending, for vital infrastructure, is pretty much going to take place regardless of what happens in the broader market or economy. And Duke will be rewarded with rate hikes that it expects to support 4% to 6% annual earnings growth. That, in turn, will translate into similar dividend growth. There's nothing wrong with this, and for the right investor, boring Duke could be a vital cornerstone to a more diversified portfolio. But if you are looking for dividend growth, slow and steady Duke is probably going to leave you a little bit...flat. That's where Brookfield Infrastructure Partners comes in to play. It currently offers a 5% yield, which is itself a nice boost over Duke. However, the real difference shows up in the distribution growth rate -- since 2009, Brookfield Infrastructure's disbursement has grown at a compound annual rate of 11%! That's more than three times as fast as Duke's historical dividend growth rate and roughly twice what Duke is expecting in the future. To be fair, Brookfield Infrastructure's distribution growth goal is more modest, at 5% to 9%. But even that is a step above Duke's current goal. 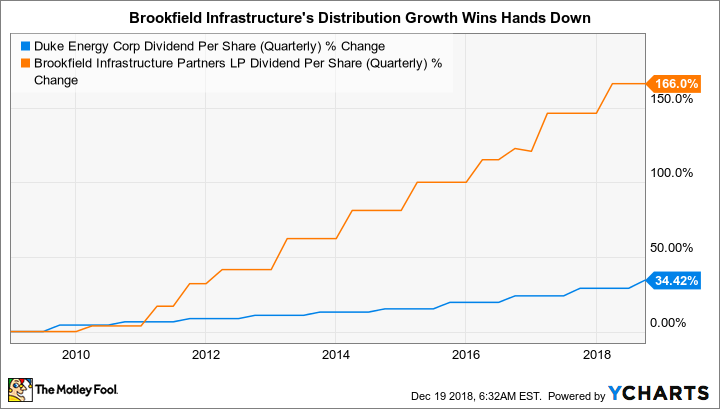 Since Brookfield Infrastructure Partners is usually compared to utilities, there's a big question to be asked...how can it support that higher distribution growth rate? The answer is that, as its name implies, Brookfield Infrastructure isn't a utility. It is far, far more diversified than that, with investments in the utility (electric and gas), midstream (pipelines), infrastructure (ports and toll roads), and data center spaces. Moreover, unlike Duke, Brookfield Infrastructure has a global reach, with portfolio investments in South America (30% of cash flow), North America (25%), Europe (25%), and the Asia Pacific region (20%). Notice the use of the word portfolio and investments here. Duke Energy owns and operates a collection of assets that are effectively the heart of the company, and you won't see many big changes. Brookfield Infrastructure owns a collection of assets that it operates, but it isn't wedded to owning them. In fact, it specifically looks to buy infrastructure assets when it believes that they are cheap, operate and improve them over time (35% of funds from operations is earmarked for maintenance and growth spending), and then sell if it can get a good price. In 2018, for example, Brookfield Infrastructure sold one asset for $1.3 billion (achieving a 16% internal rate of return over the 12-year holding period) and bought six more for a total of $1.8 billion. That, in turn, gets to the core of the Duke or Brookfield Infrastructure issue. Brookfield is looking to opportunistically invest across the globe and across a broad spectrum of asset types. The ultimate goal is to grow the business over time so it can support solid 5% to 9% distribution growth on an annual basis. This diversified approach gives it several options in achieving that goal. Duke's goal is far more modest. It simply wants to be a good utility that grows slowly and steadily over time, rewarding investors along the way with reliable, but more modest dividend growth. It's important to stress that there's nothing wrong with Duke's approach or goal. But for dividend growth investors, Brookfield Infrastructure's approach and goal will be far more appealing. That said, you should expect more volatility along the way, since Brookfield Infrastructure's game plan is more aggressive. However, so far, that added risk has been well rewarded with a materially higher distribution growth rate.